There is just so much going on right now. Personally, Locally, Nationally, Globally. Unless it’s happened to you – or you were there – you can not believe everything you read, hear or even see. Even then I suppose it’s subject to perception. I jumped on the Justice for Trayvon bandwagon with no first hand information – I got sucked into the media circus. I do believe, with absolute certainty, that we, as humans, can be persuaded to one side of an argument or another if only one side is pushed down our throats around the clock. Still, as a mother and a human, my gut is uneasy with the ruling. George Zimmerman IS guilty of killing Trayvon Martin. Did the prosecution have enough evidence to prove that he killed him unjustifiably? Beyond a reasonable doubt? Obviously we have a deceased 17-year-old who died at the hands of another – that’s evidence enough for me to warrant some sort of justice! The uneasiness I feel stems from the fact that there appears to be no justice. But again, I don’t know that. I don’t know if George Zimmerman has night terrors, is wracked with guilt – if his wife lies beside him at night thinking he’s a monster now. If he’ll ever be able to resume any semblance of a ‘normal’ life. He was judged in the court of public opinion – and that court does not adjourn. My heart breaks for the Martin family. I do know this. There is no coming back for Trayvon. Not from this. Onto Cory Monteith. 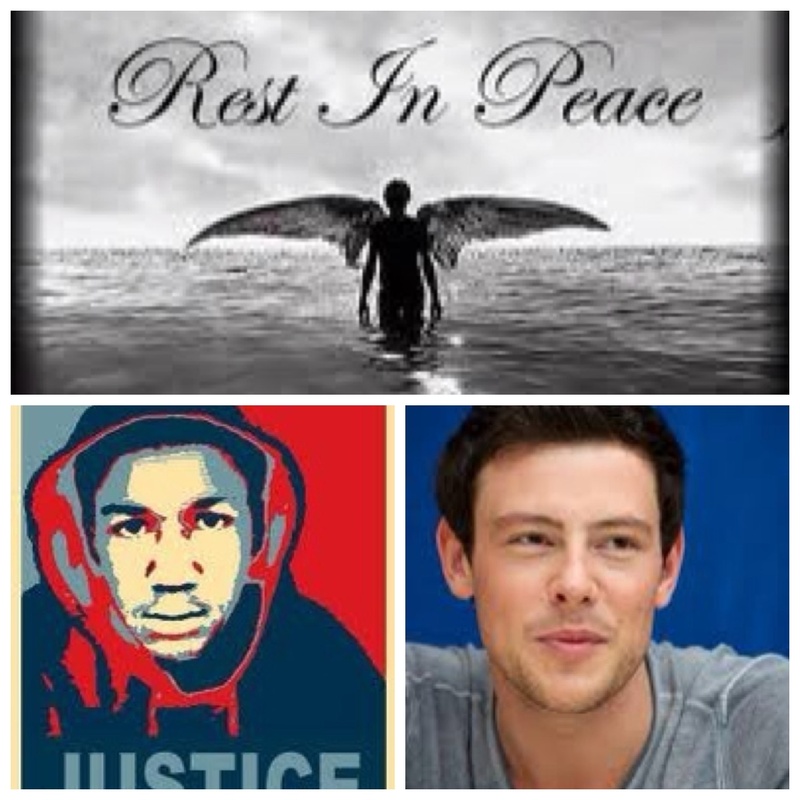 One of my guilty pleasures is the television show ‘Glee.’ I was saddened to hear that one of its stars passed away. Only 31 years old. And why does it seem like more of a loss when someone is young and talented? Shouldn’t every life should be both celebrated and mourned when it comes to an end? Cause of death has not been determined yet, but, since they’ve stated foul play does not seem to be a factor, and since Cory recently exited a rehabilitation facility for substance abuse – the threads about his death have concluded (without actually knowing yet) that he died of an overdose. He was found alone in a hotel in Canada by staff after he failed to checkout by checkout time. For all the fame and wealth and celebrity that he had – he is gone and not coming back. It doesn’t make a difference to me what cause of death was. It’s a terrible shame and my heart goes out to his family, friends and to his fans. If it was an overdose, I hope intelligent conversations can shed light on the issue of addiction. That some good can come from that conversation. On a personal note, I spoke with a dear friend yesterday that lost someone she loved. The cause of death is also unknown – but what is known points to suicide. She is left not knowing. Wondering. Living with questions and regrets. And even if the autopsy report concludes ‘overdose’ – she will still not know. Did he mean to end his life? Was it an accidental overdose? Was it a cry for help that went too far? Because – he too, is not coming back. What is left are the people who knew and loved him trying to pick up the pieces and digest what they don’t know in order to move forward with their lives. “I don’t know.” Not knowing something puts us in fear. Then again, I would rather hear “I don’t know” from someone rather than be given false information. And when I’m asked a question I don’t have an answer for – I admit it. Then if it’s important enough to me, I’ll educate myself on the topic or research an answer. In my personal life – I’ve taken the very blunt, play-no-games approach. I know how it feels to be in the dark – to not know where I stand. I choose today to not make someone else feel that way. It’s not kind and it’s not fair. But then life is often not what I would consider ‘fair’. I’ll speak for myself when I say that I tend to want what I consider a just, and reasonable beginning, middle and end. But life is not like that. I don’t know, but I would imagine the Martin and Monteith families probably agree today.